I like things to have official beginnings, even if they are spontaneous. So when I was perusing the local fall race calendar and saw a listing for the Peter Rabbit Cross Country race in Prospect Park, I immediately recognized it as an official beginning–to my ultramarathon career. Sure, there are ultramarathon road races, but the vast majority are run on trails. I’ve never run on trails and a beginning was required, so I signed up. It turned out to be a good thing. The three-mile-ish race at Prospect Park was organized by the Brooklyn Road Runners Club. It was a cozy affair, with just 50 runners lined up on a chilly December morning. Someone yelled “GO!” and we were off, running a path marked by small red and pink flags. The path took us over some killer hills and mostly over grass, with a couple of diversions onto dirt path. Cheerful club volunteers were posted at the far end of the loop to clap and make sure we didn’t veer off. 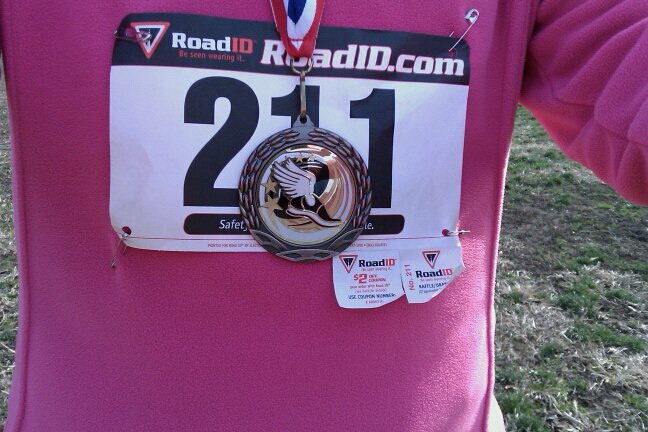 The finish line was a bit haphazard, but I finished with a good time and came in 11th among the women finishers. That was good enough for a medal! It was a good beginning to my long running career. It was challenging and fun at the same time. I met some great people, which was a bonus.